Once upon a time in the not too distant past, Jermell Charlo was one of the flavors of the month. 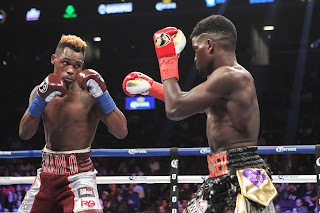 A young kid with a good amateur pedigree but not much of a fan base, Charlo was given slot after slot on Showtime, often against less-than-worthy competitors. It was as if he was being foisted upon us by power broker Al Haymon and Showtime boxing; there was little demand from the boxing community for his services. Through his development fights, Charlo had proven to be a competent boxer but not exactly a sizzling talent. He had a fantastic jab, good footwork and was generally well coached. However, he seemed to be missing an "X-Factor." Sure, he had some skills, but why should we care? And why was he always on TV? Flash forward to Saturday night, where a top amateur prospect, one with even more hype than Charlo had, was getting his first title shot on a Showtime undercard. Erickson Lubin, just 22, had been considered one of the best American amateur boxing products before turning pro. In his brief time in the professional ranks, he had amassed a record of 18-0 with 13 knockouts. Despite not having faced legitimate tests as a pro, his team and handlers determined that it was his time to get the glory. The only issue: he had to go through Jermell Charlo first. Within moments after the start of the fight, Lubin twitched on the canvas, unable to move his upper body after a pinpoint uppercut from close range. And just like that, a young prospect turned to dust. During his post-fight interview, Charlo, accompanied by his brother, Jermall (a former junior middleweight titlist who now campaigns at middleweight), was downright surly. Aggrieved by what he perceived as the wheels of the boxing business trying to roll over him, Charlo was unable to provide a note of grace. His anger seethed to the forefront. Unlike many current champions, Charlo had had a long gestation process in his ascension up the ranks. 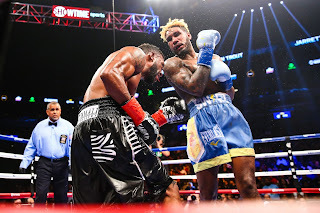 Before he received his first title shot, Charlo had faced notable fighters such as Denis Douglin, Demetrius Hopkins, Gabriel Rosado and Vanes Martirosyan. These were credible B-level boxers who had helped Charlo refine his craft and improve in the ring. When Charlo finally fought for his first title in 2016, he felt like he had earned his opportunity. Lubin's resume included none of the types of fighters that Charlo had faced on his way up. He was on an expedited journey to the top, competition be damned. However, there are very few fighters in the sport who can prosper while taking shortcuts at the highest level of boxing. Yes, there are extraordinary talents that can make it to the top without traditional development, but they are a rare breed. Errol Spence made such a leap this year when he defeated Kell Brook in England. But at least he had faced a recent titleholder in Chris Algieri prior to his shot. He also had international Olympic experience and unlike Lubin was already 27 years old, far farther along in his maturity and development. Gervonta Davis was another fighter who had made a similar leap this year by winning a title over Jose Pedraza, but already those early signs of promise have started to look like misplaced optimism. Davis missed weight last fight, giving up his title belt on the scales. He also got hit a ton in that fight against a guy who was brought in to get KO'ed spectacularly. Davis, like Lubin, is 22 and already faces an early precipice in his career. Are these examples of too much too soon? There is no science in developing fighters. No one gets it right 100% of the time. Even the best make mistakes. However, giving a hot prospect paltry opposition does no one any good. The fighter gets shortchanged. His trainer doesn't get enough of an opportunity to iron out issues in the gym. His handlers don't know exactly what they have in front of them. And although it's true that anyone can get knocked cold by a shot, the specific events of Saturday night's fight suggest that the knockout wasn't some type of fluke accident or serendipitous punch, but rather it was an instance of one fighter prepared for the moment, and the other one not. Charlo fired off a basic double jab. At that point, Lubin ducked his head down and to the right to avoid the shots, losing eye contact with his opponent. Charlo came back with a right uppercut that Lubin never saw. And that was that. Again, this all manifested from a basic set up that one sees at the gym every day. The fight had not gotten ragged and the knockout couldn't be attributed to fighter fatigue or the attrition that so often happens in boxing. That moment was a fighter making a glaring mistake from an ordinary boxing move. Lubin wasn't able to defend himself from a simple double jab. He gave Charlo a free shot. Lubin and his team could have observed these problems against an easier opponent, rectified them in the gym and prepared better for the next level. Development bouts exist to minimize the defensive issues that Saturday's fight so easily exposed. Yes, it's nice to create shiny records on the way up, but the real point of development fights is to get better, to hone and to perfect one's craft. I don't really understand the inner workings of Haymon Boxing. Some fighters get pushed early for a title (Broner, Jacobs, Davis, Lubin), while others have more traditional development tracks (Thurman, Danny Garcia, the Charlos). What's clear to me is that there is no consistent plan by the organization for development. Although every fighter possesses unique attributes, there should at least be some sort of standard building block process, which can be augmented or changed if needed. Taking young talent and throwing them at a dartboard might lead to some bullseyes, but more often that approach will miss the mark. Fighters have enough to worry about in the ring without being shortchanged in their development. They need to be put in the best position to get the most out of their talent and abilities; Lubin was not. On another note, it's no accident that Charlo has started to ascend in the sport after going to a different trainer. Jermell has gained confidence in the ring. He no longer believes that he's the brother who can't punch. With Derrick James, who also trains Spence, Jermell is sitting down on his shots a lot better than he did while under Ronnie Shields (who still trains Jermall). Jermell is also more comfortable in the pocket now, confident that his chin and punch can protect him. These are noted advancements. Over the last year, the Charlo brothers have turned into belligerent heels, which is fine by me. At its core, boxing is built on combat. Not everyone needs to be or should be loved. Villains are necessary for the sport to prosper. Juxtapose the Charlos lashing out at the world against the queasy image from Saturday's broadcast that featured rival titlists Keith Thurman and Errol Spence sitting next to each other watching the fights like two business colleagues. They could have been sharing a late cup of tea. Yes, there should be sportsmanship and civility in boxing but the Charlos (perhaps rightly) feel that they have been marginalized in the sport, and perhaps by some in their management. They have grievances and instead of letting their anger manifest in unproductive manners outside the ring, they have channeled their resentments and used them to help make them even better fighters, a valuable lesson for fighters. If their collective anger continues to lead to devastating knockouts, that's wonderful for them – and the sport. It's been a rapid transition for the Charlos. After years of toiling on undercards, they are now must-watch TV. Although some may object to their belligerence during interviews, they can be ignored no longer. They now matter. I made a list of good vs. bad attributes that Jarrett Hurd exhibited in his fight against Austin Trout on Saturday. To be kind to Hurd, I could've kept going on the "bad" list but I think that my point should suffice. He did so many things wrong against Trout, yet he scored the best win of his career, and did so emphatically. He essentially beat Trout with just a short right hand. Make no mistake: it's a pulverizing punch, but that's all he had. Trout seemed to dig his own grave in the sixth round. Boxing beautifully early in the fight, Trout got greedy in the sixth, standing in the pocket trading with Hurd for far too long. I nudged my girlfriend and shouted out to no one in particular, "What's he doing? He can't stay in there!" Barely could I finish that sentence before Hurd connected with a powerful right hand that sent Trout staggering back to the ropes. In the final moments of the round, Hurd connected with another powerful right that I thought had really hurt Trout. To me, Trout was never the same in the fight. In the eighth round, Trout looked like he was ready to go. With wobbly legs and a sharp reduction in his offensive output, Trout was still in the ring only on account of his intestinal fortitude – and Hurd's inability to finish. Hurd didn't have the resources to put punches together that could lead to a knockout. He neglected the body. Throwing in combination was an afterthought. He just marched in and waited for another opportunity to land a right hand. Trout was able to survive the eighth and even made it through the tenth before the fight was stopped in the corner. He had taken a serious beating. Hurd's performance reminded me of the recent efforts of lightweight champion Robert Easter. On two occasions Easter had an opponent ready to be stopped and yet he lacked the strategic and technical abilities to finish them. It almost costed him a win against Richard Commey. A 114-113 card gave him a split decision victory. Hurd has come back from behind to notch knockouts in his last two fights. However, not all fighters will wither from his right hand. At this point, he's getting by on physicality, athleticism and a right cross. However, that won't be enough for the other top guys at 154. At 27, Hurd is in his physical prime. There won't be much additional physical development left ahead. What he needs is a crash course in boxing fundamentals and technique. I'm sure that his current trainer, Ernesto Rodriguez, is a swell chap but it's time for Hurd to go to finishing school. With another trainer Hurd might need to take a step back in order to go two steps forward; however, it's warranted. I hope that his team or his handlers realize that they are in a pivotal inflection point in his career. Should they continue on their current path, he will get soundly beaten by the Charlos and Laras of the world. But if he can spend a good six-to-twelve months with one of the sport's better teachers (someone like John David Jackson comes to mind), then he would put himself in position to make the most out of his boxing career. Hurd's rise in boxing has been rapid, as it has been unexpected, but a plateau is coming unless he perfects his craft. Switching trainers isn't going to be a comfortable decision for Hurd – there are loyalties and histories involved – but it's the right step for where he is in his career. 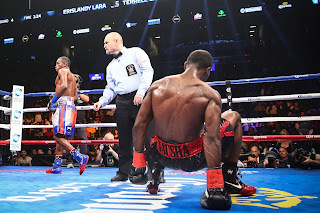 Erislandy Lara soundly dominated an overmatched Terrell Gausha on Saturday in a fight that was nominally the headliner but in actuality served as the walkout bout for the evening. 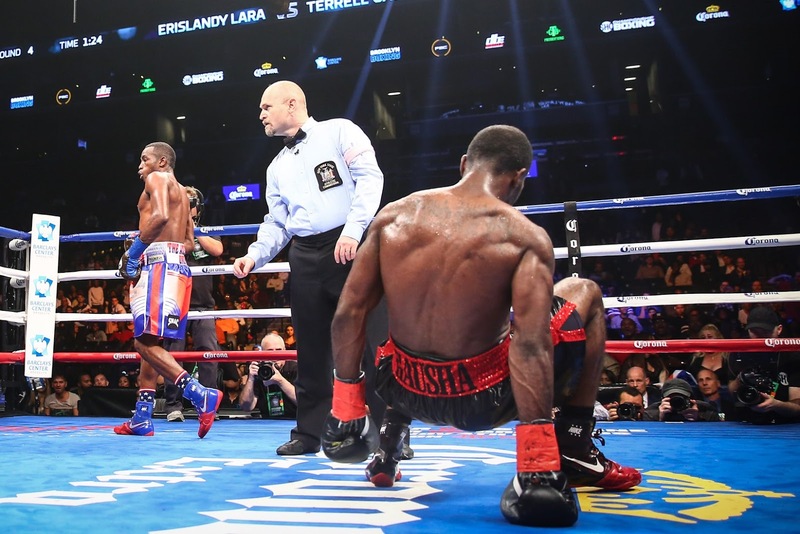 Lara did his thing: reducing an opponent's output, sharpshooting with left hands and draining sustained action from the fight. To be fair to Lara, he didn't run like he has in some of his past bouts. He mostly stayed in the pocket and tried to win every round. Gausha, somehow once an Olympian, didn't offer much of anything. Whatever success he had as an amateur hasn't translated in the professional ranks. He's not fluid in the ring, he's chinny (knocked down again on Saturday) and he doesn't possess notable power. And he's already 30. Essentially, Lara was Gausha's cash out fight. His handlers gave him $200k and a title shot, with little thought that he would actually win. As far as they were concerned, they had done their job. Unlike Lubin or Gervonta Davis, there was no time for additional development. Perhaps Gausha would've had an easier time with another of the titleholders at 154, but that's neither here nor there; he was never a threat at the top level. At 34, Lara has been on the world level since his Carlos Molina fight in 2011. By now, boxing fans have had ample time to evaluate what he brings to the table. And with that knowledge many of them voted with their feet by leaving the arena on Saturday during his fight. Lara might be the most representative example of the Cuban school in professional boxing: cautious, great footwork, ability to control the ring, fantastic rear hand, low punch volume and cerebral. He's not a joy to fight or watch but his talents are considerable. He has two losses and two draws in his career, all of which are debatable, but with the exception of a passionate few, it's a debate that very few are eager to have. Lara engenders a lot of "so what" in boxing. He's a factor. He exists. He has to be dealt with by someone. And the overwhelming majority of boxing fans probably hope that he gets dealt with sooner than later – and dealt with for good. But that person wasn't Gausha, and it won't be anyone other than a truly special fighter.